We’re starting off the Christmas Update Marathon with a BANG!! I recomend everyone who owns a I Dream of Jeannie Collection, go watch Season 3 Episode 9, “Meet My Master’s Mother”, for even MORE meaning to this comic. OR go to this link ‘ I Dream of Jeannie Season 3 Episode 9 Meet My Master’s Mother’ to watch the episode. Hopefully Araceli has more in mind here than just disturbing Natelie’s sleep. I think its more of her realizing she’s gone a bit far with her last attempt to wake the new girl up. Araceli’s thought on the second to last panel? Where’s the kaboom? There should be an earth shattering kaboom. Ah nostalgia. Martians are always good for it. 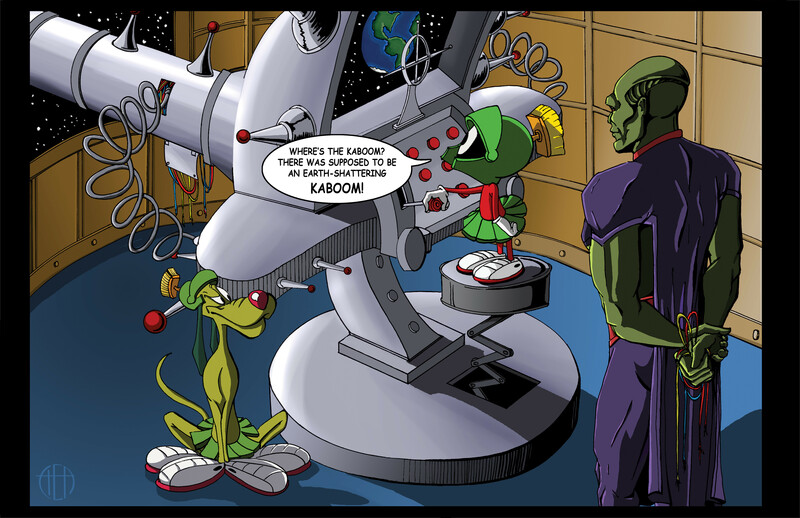 Where is my iludium-pu-36 explosive space modulator? Bugs Bunny swiped it as always, Marvin. Oh Dear, I’ll have to call out the reserves. To me its more a Panel 9 = This’ll wake her, Panel 10 = uh maybe too much, panel 11 = how do i turn this off? …aaaand there goes a load-bearing wall. …and how has no one else woken up? …How do you sleep through so much of that commotion? On a side note, that cannon wasn’t actually loaded, was it? I would suppose that it had a blank charge (to make the “boom”), but no projectile. And the answer to why she went through all that trouble when she could have just *poofed* her away? Cause it’s funny! Looking at the IDOJ episode, I wonder if we’ll ever meet Neil or Jean’s families. Poking Nat with a stick wouldn’t have been as funny. It would be funny if Natalie yell’s out at Araceli to quiet down, because your making too much noise over there. I am trying to sleep right now. Araceli, if you only knew who this was, you’d be treating her differently.